Available in Silver or Black, the Sparq Arc LED Floor Lamp by Brightech delivers the moon to homes and workspaces. This innovative design perches an illuminated crescent-shaped LED light fixture atop a wire-thin metal base. The moon-like light curves over you as you read, create lesson plans, or meditate. Both the height and brightness are adjustable. A foot pedal switch operates the power and dimmer functions. Step once to switch on at 100%, a second tap dims the arc to 50%, a third step brings dims light to 30%. Tap a fourth time to power the free standing lamp off. The foot pedal works more efficiently when you are barefoot or wearing socks. Shoes and boots off please! Thanks to the advanced LED technology, the crescent beam of light never overheats. It stays cool to the touch after hours of use! The 3,000 Kelvin color temperature is bright enough for reading, yet soft and gentle on the eyes. Using only 15 watts, it’s a real energy saver too! Despite the slender shape, the Sparq Arc Floor Lamp surrounds you with warm white light that imbues a calm atmosphere. What’s in the box and how does it all fit together? Sparq’s box measures 11″ wide by 53″ tall. It contains the Arc LED head, a pencil-thin silver or black finished stem, a numbered diagram for assembly, a power cord with attached on/off pedal switch, and a weighted base in its own separate mini-box. The stem fits easily into the base by turning it clockwise several times until tightened securely into base. You won’t even need a screwdriver! The Arc fixture attaches directly into the top of the stem. You may hear a slight click as they align, no turning necessary. Stands approximately 5 ½ feet tall when fully assembled. Upper stem and fixture may tilt a little as you position them to the right spot; this is normal. Stands well on carpeted floor and slides easily across carpet where you want it to be. 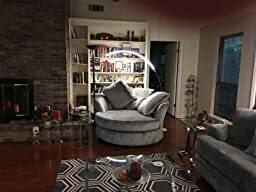 SHINE ON, CRESCENT MOON – Embrace futuristic mood lighting with this crescent-shaped, ultra-thin LED bulb that’s attached to a flexible metal stand. Gently move the wire to curve the light above you until you achieve perfect lighting for writing or task work. The standing lamp atmospherically arches over drafting tables, home office desks, plush sofas, or recliners. Adjustable height extends approximately 47 to 66 inches. Sturdy 9-inch wide base firmly anchors this one-of-a-kind leaning lamp. STAY COOL, PAY LESS – Bask for hours in bright, soft light while never overheating the room with this energy saving 15-watt LED fixture. Read a book or review documents comfortably throughout the night on the brightest setting. 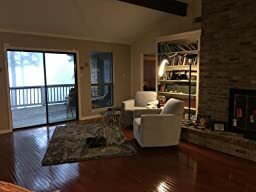 The lower settings let you meditate peacefully or provide a night light for Netflix streaming marathons should you need to light the way to a snack. You will never need to replace the bulb as LED’s lifespan lasts for tens of thousands of hours! Assembles in minutes. 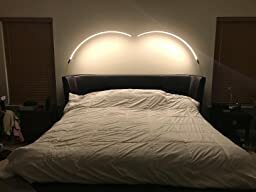 A NOTE OF WHIMSY SPARQS THE IMAGINATION – The skinny, illuminated curve design has a floating appearance adds a whimsical dimension to your home or apartment decor. With its lean frame bending over you in an arc of light, the Sparq Floor Lamp could almost be a Dr. Seuss character. Splendid for a child’s bedroom or play room! We even made the lamp so lightweight and portable that it’s easy to rotate the crescent of light to brighten different areas around your house, practice space, or studio. 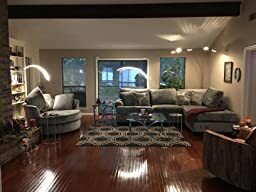 3-STEP MAGIC TAP LIGHT DIMMER – With a 3,000 Kelvin color temperature and 2000 Lumens, the Sparq high arc floor lamp bathes your living space in warm white light that’s easy on the eyes. A foot pedal switch easily operates both the power and dimmer function of the arc lamp. Step lightly once to switch on at 100%. The second tap dims the arc to 50% while a third step on the pedal brings moody ambiance as the light dims to 30%. Tap a fourth time to power the LED light bulb off. SATISFACTION GUARANTEED WARRANTY – Brightech stands behind our products 100%. All of our lamps come with a full 3-year warranty. If for any reason you are not satisfied with your purchase, please contact us because our industry-leading commitment to you will make things right! Brightech lights the way to customer satisfaction while focusing on creating innovative yet affordable lighting to infuse the color of light into every room of your life. We love this lamp. We got the first one and I forgot to tell my husband about it. He put it together not knowing what it was supposed to do and came in to tell me “there was no light attachment”. However he plugged it in and was taken aback and loves it also. It is really beautiful and so modern, but simple. We got three more and they really look great in our newly remodeled living room. They give plenty of light for reading at each site. I like how this lamp looks a lot. My son described it as looking like a crescent moon hanging over me when I am reading. But it has one big flaw. It is very bright, and there is no way to dim it. It is distracting when someone else is in the room, say trying to watch TV. However, with the addition of a $6 infrared LED controller from Amazon (ASIN:B00KL4A424 NEWSTYLE 40 Keys Infraed Remote RGBW Controller IR For RGBW RGBWW LED Strip Light) , I have resolved that problem. My lamp now is completely dimmable — from barely lit to full brightness — and I have a remote control to do it with! The controller goes between the power supply and the lamp. There is a plug at the base to connect the two. It was easy to add the controller using some standard LED wiring parts. If I set it to a certain brightness, the controller remembers the setting when turning on and off the lamp using the foot switch. To change the setting, you must point the remote at the infrared sensor on the controller. With the controller added, I give it 5 stars. Without, just 3. LOVE LOVE LOVE. We got two of these to go over our bed and to use when we are on our laptops or reading and fell in love. They generate enough light that with both of them on, we do not need to use our bedroom light. With one light, it is enough for the both of us. But c’mon- you have to admit that they look great as a pair.